Given the R8's brother-from-another-mother, the Lamborghini Gallardo, has been in drop-top form since 2006 it should come as no surprise we'd be seeing an Audi R8 Spyder at some point. Contrary to earlier reports, the R8 will not be a targa with a lift-off roof, but a genuine soft top convertible utilizing a similar, if not the same, stowage and roof design as the Gallardo Spyder. 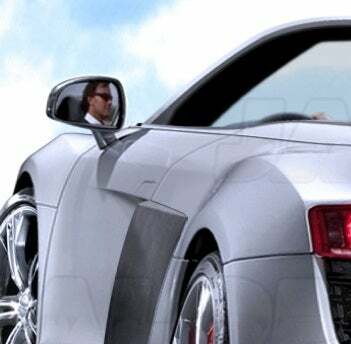 Hit the jump for our rendering of what the new 2010 Audi R8 Spyder may look like. Click Here For Our Rendering Of The Audi R8 Spyder! Aside from a missing top, recent spy photos show that the R8 Spyder seems to have lost its signature sideblades as well. Don’t worry kiddies, we're pretty sure that's just a clever sleight of hand by those crazy Germans to distract from the final blade design. Sources say the design will be encased by the sidecove intake shield. However there may be different versions depending on the engine — that's right, depending on whether a V10 is initially offered as an engine variant for the pretty supercar, a V10 may end up having a more prominent, open design to feed air into the more powerful engine. And don't even get us started on what a diesel offering will end up giving the R8 in terms of design changes. In addition, the R8 Spyder will likely gain a new rear engine cover incorporating two large vents to release heat from the 420 HP / 317 lb-ft 4.2-liter FSI V8 or the new 5.2-liter FSI V10 loosely based on the LP 560-4’s engine (again, it's just a rumor — and we'd be shocked to see it happen). Rumor has it, the V10 will produce anywhere between 500 and 550 HP. Other changes will include a pair of rollbars behind the seats and the fuel door relocation to the quarter panel. Most other changes will be under the sheetmetal for chassis strengthening. Some say he has a tattoo of a Saleen S7 on his rear end. Others tell us he was born with a penchant for oil rather than his mum's milk. All we know is he's called the Auto Insider and he's always ready to provide the scoop from the other side of Eight Mile.